University of Illinois Press, 9780252083327, 304pp. Cast as the ultimate hardhats, football players of the 1960s seemed to personify a crewcut traditional manhood that channeled the Puritan work ethic. Yet, despite a social upheaval against such virtues, the National Football League won over all of America—and became a cultural force that recast politics in its own smashmouth image. Jesse Berrett explores pro football's new place in the zeitgeist of the 1960s and 1970s. The NFL's brilliant harnessing of the sports-media complex, combined with a nimble curation of its official line, brought different visions of the same game to both Main Street and the ivory tower. Politicians, meanwhile, spouted gridiron jargon as their handlers co-opted the NFL's gift for spectacle and mythmaking to shape a potent new politics that in essence became pro football. Governing, entertainment, news, elections, celebrity--all put aside old loyalties to pursue the mass audience captured by the NFL's alchemy of presentation, television, and high-stepping style. 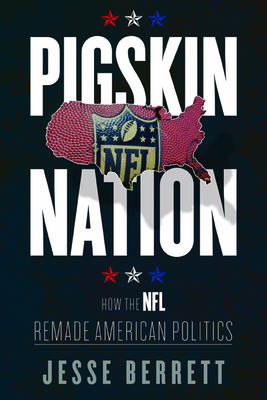 An invigorating appraisal of a dynamic era, Pigskin Nation reveals how pro football created the template for a future that became our present. "The current collision of football and politics boils out of a half-century of violence, skullduggery, idealism and greed brilliantly exposed in this fascinating and fast-paced scrimmage of a book." Robert Lipsyte, author of "SportsWorld: An American Dreamland."